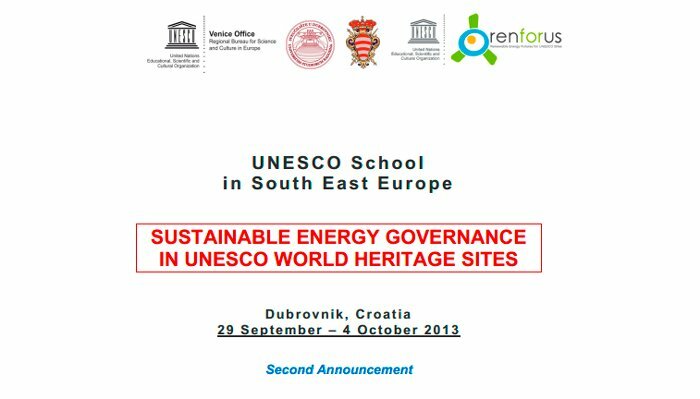 UNESCO Venice Office is pleased to announce the UNESCO School in South East Europe: Sustainable Energy Governance in UNESCO World Heritage sites scheduled to take place in Dubrovnik, Croatia, from 30 September to 4 October 2013. The School will be held at the University of Dubrovnik. The course will also include a number of team working sessions and on-site exercises which will use the World Heritage Site of Dubrovnik as a demonstration case. Finally, trainees will also participate in the International Fall Workshop: “Upgrading Life in Historical Towns – Renewable Energy” (Dubrovnik, 4 October 2013) which will be part of the UNESCO School programme and where they will present the outputs of their work at the final day of the conference. Promoting the interface between young researchers and practitioners with industrial partners of high profile for the improvement of summer school technical provision and follow-up. With its interdisciplinary approach the School targets a broad audience that includes World Heritage managers, scientists, practitioners and researchers with applied interests in sustainable energy governance issues, preferably but not exclusively in UNESCO designated sites, from following countries in South East Europe and Caucasus: Albania, Armenia, Azerbaijan, Bosnia and Herzegovina, Bulgaria, Croatia, Cyprus, Georgia, Greece, Republic of Moldova, Montenegro, Romania, Slovenia, Serbia, The former Yugoslav Republic of Macedonia, Turkey, UNMIK/Kosovo. Postdoctoral researchers in natural and human sciences on sustainable energy governance related topics. Graduated energy related professionals working in the public (municipalities, agencies, research institutes) or private sectors (enterprises, NGOs, etc.) with at least 3 years of experience in the field of Sustainable Energy. Knowledge of and work experience in UNESCO designated sites would be an advantage. All candidates should have good knowledge of English. They should be able to work in teams and in an interdisciplinary fashion. They will be required to take part in all the activities foreseen in the programme. At the end of school, they will be required to make a public presentation as decided and assigned with the tutor(s) on a particular module/theme at the conclusive session of the International Fall Workshop: “Upgrading Life in Historical Towns – Renewable Energy”. No fees will be required by selected participants. The organizers will cover full board accommodation costs. Official language of the school is English. Students will receive an official Certificate of Attendance. Please before applying, be aware that due to the intensive nature of the programme and its short duration participants may be asked to work beyond the scheduled work time. Applications shall be submitted by email to veniceoffice-sc@unesco.org. Candidates shall provide their CV and a short letter of motivation with related experience in sustainable energy (both documents in English). Deadline for application has been extended to 2 September 2013. The selection of candidate will be carried out by an international panel of experts. Selected candidates will be notified of the outcome of evaluation by 5 September 2013. Note: References to Kosovo shall be understood to be in the context of UN Security Council Resolution 1244 (1999).